It is impossible to walk a prairie and not use some time for reflection. Sometimes rolling hills of grass, other times colors blazing, and still others mother nature’s fury on the plains. You can experience all of this on a prairie walk. Comfort in the tall swishing grass. Wonder at the color available in the wildflowers. Contrast between the wet boggy areas and dry mima mounds. The rich heritage of Missouri’s prairies includes the Osage Indians’ love and respect for this land. In the book by Robert Liebert,Osage Life and Legends, he discusses their love of the prairies that helped sustain life for them. Members of the Chert Glades chapter of Missouri Master Naturalists bonded with our Osage forefathers on a recent evening walk at Coyne and Welsch prairies in southwest Missouri. 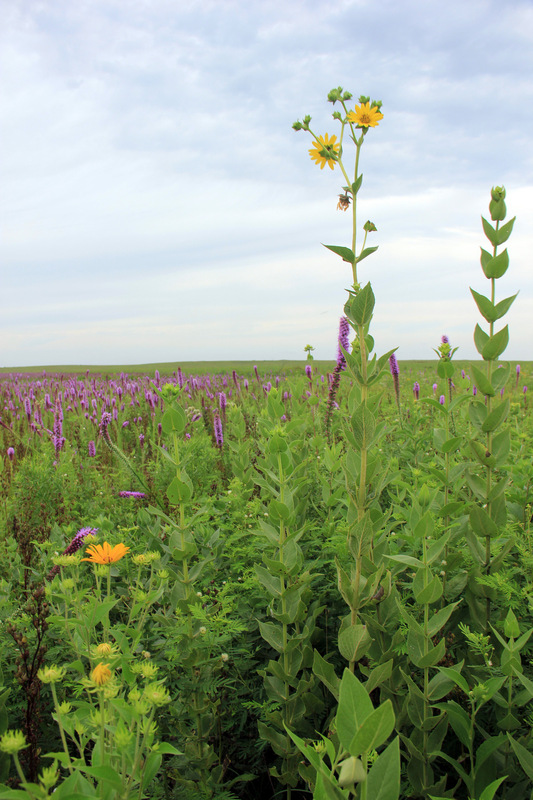 Prairie walks among naturalists are full of discussion, discovery, and decompression. We typically fan out into small groups each with a different objective. This is not planned, it occurs naturally. Some will discuss and photograph the sighting of certain plants, some will search for an endangered species, and others will simply walk with thoughtful gracefulness and observation. 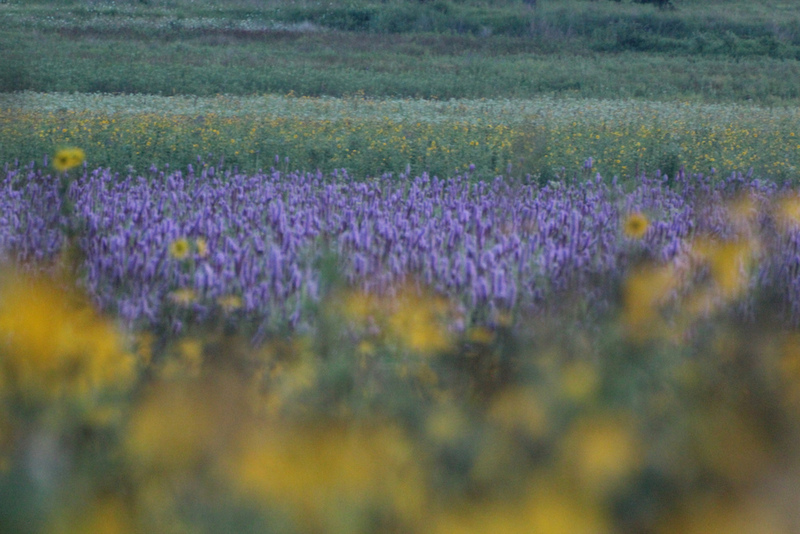 It is a site to behold, with the love of prairies so obvious in each person’s fervor. Jeff Cantrell (MDC) offered this summary of the evening’s events: “Our first evening was a lengthy walk (for I was short on time to scout), hindered by some standing water while we raced the twilight. But now that I (we) know of some highway pull-offs the “valley of the blazing star” is very easy to reach. However all of the site produces wonderful discoveries every time we go out. 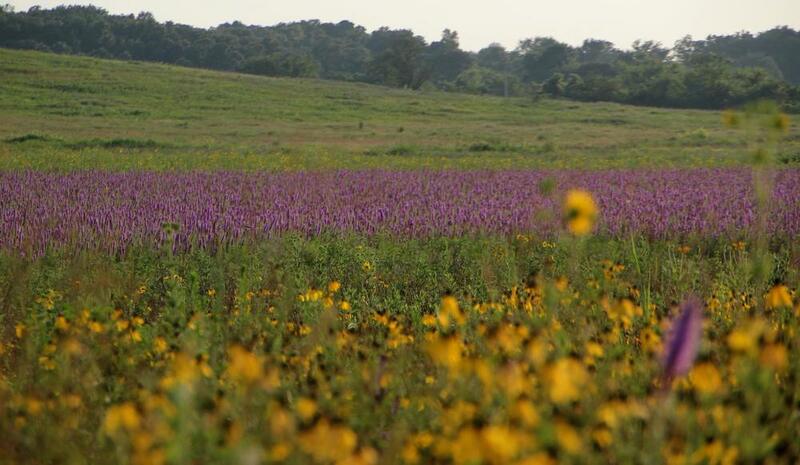 Some of our discoveries include lots of Wild Petunia (Ruellia), Rattlesnake Master, various forms of Rudbeckia, and sunflower species ready to take control of the grassland. My favorite was the seedbox clinging to the eroded banks. Blazing star was the hit of the evening. 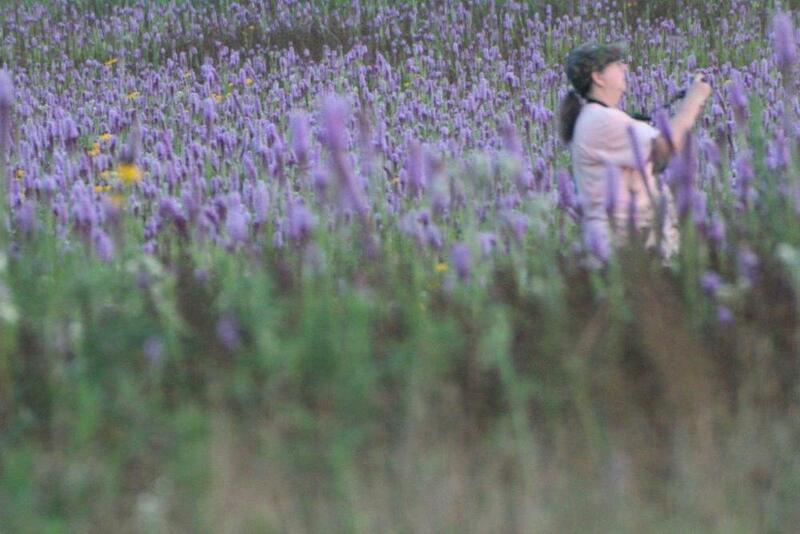 Many naturalists could not believe the “sea of purple” they saw, and some could not wait to get to another prairie location to see if the purple was evident there. It is this unique character of prairies, ever changing – ever the same, that draws us to them. You never know what you will find, each location seeming to have its own agenda on when certain plants will bloom. The Osage Indians attempted to reflect the natural order of the earth in every part of their lives, with total respect for the natural world. Today’s master naturalists must have inherited that conviction from them. Our view is to respect the peace, harmony and order of nature while continually learning how to preserve and protect it. There is no better way to accomplish this than to get out there and “be present” on prairies and other natural areas to observe firsthand the amazing glory that surrounds us. Please enjoy photos from several of our talented photographers from our evening on the prairie. Posted on July 24, 2015 by Shawn Kirkbride and tagged ECOSYSTEM EDUCATION ENVIRONMENT grasses LOCATION osage indians NATURE MISSOURI MASTER NATURALIST plants prarie. Local prairies are full of amazing color right now so it is fitting to spend some time during the week of the summer solstice observing a local prairie. I always find time during this week to visit some prairies because they are at their peak of blooming. “I was raised on county sunshine, green grass beneath my feet. I was not raised in the country; I grew up in suburban St. Louis. But that did not stop me from seeking out any tiny patch of green grass, fields of flowers, or a creek to wade in when I was young. Summer was an endless time of staying outdoors hours at a time, exploring natural places, and searching for anything wild; turtles, snakes, bugs, and lots of dirt. At a young age I was fascinated with wildflowers. Not yet acquiring my “naturalist mentality” I picked some every day and had vases of flowers all over the house. Today, I find it more satisfying to leave the flowers there for everyone to enjoy, and assure they can reseed for the next season. My favorite prairie, Diamond Grove, dressed itself in my favorite color, yellow, for the first day of summer. Purple headed sneeze-weed, cownbeard, black eyed susans, and coreopsis created a yellow carpet wonderland for butterflies, dragonflies and birds. Contrasting colors came from bright red-orange Indian paint brush, blue spider-wort, and pink sensitive brier. 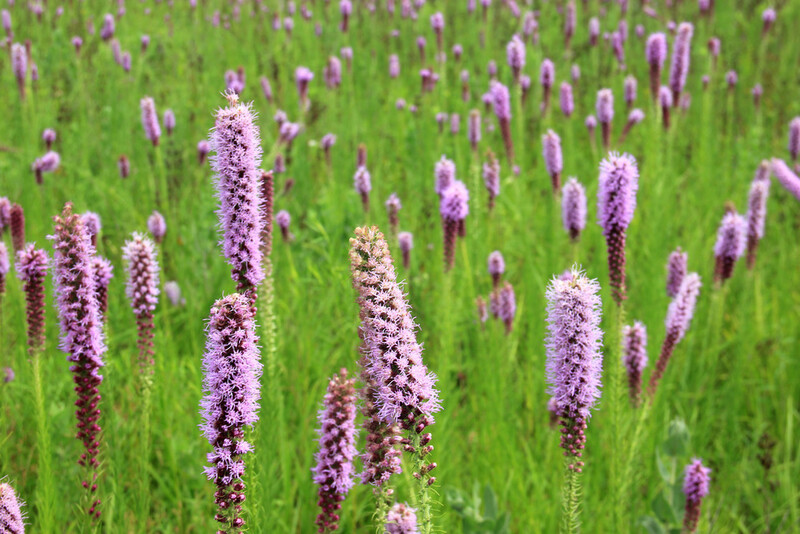 Hard to find milkwort, wild petunia, and Deptford pinks shyly hid in the under-story of the tall grasses. 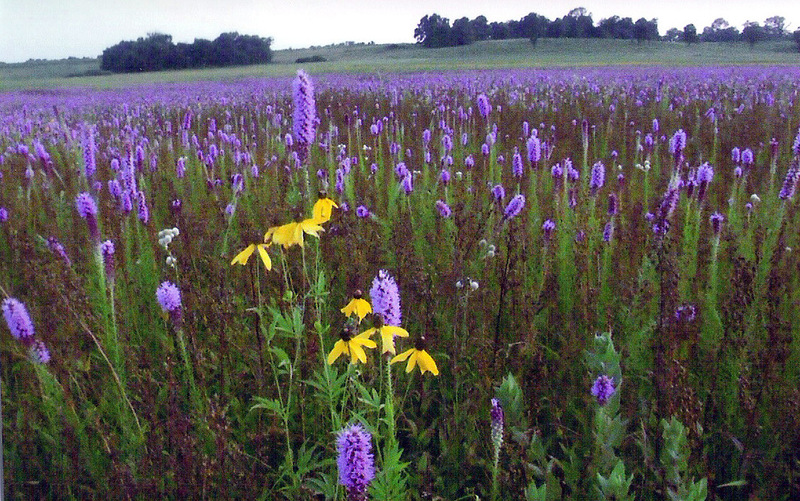 My second favorite prairie, Linden Prairie, was ablaze with color. Dark pink poppy mallow waved above the tall grasses, gray-headed cone flowers delicately shifted their heads in the wind, and bright yellow ox-eye sunflowers beamed in the sunlight. At Linden Prairie, I recorded eight species of butterflies and two types of dragonflies while listening to dickcissels and many other birds call from one end of the prairie to the other. I had the whole prairie to myself, which was both wonderful and sad at the same time. Sad because others were missing what I got to enjoy. Many cultures observe the summer solstice as a turning point in the year. On the prairie, it is also a turning point. It is the beginning of the end as wildflowers are at their peak and we begin to observe the seeds of summer’s end. So get out there and absorb some country sunshine and get some green grass beneath your feet on a local prairie. You will be better for it! Posted on June 26, 2015 by ann butts and tagged BIODIVERSITY birds ECOSYSTEM EDUCATION ENVIRONMENT FAMILY LOCATION MISSOURI prairie.